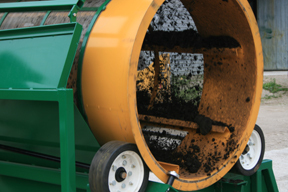 Screens compost, soil, peat and minerals for bagging and convenient distribution. Continuous feed hopper provides maximum compost flow-through efficiency. The compost screen is capable of handling up to 90 cubic yards per hour. Dividing towbar can be folded back against the screen for easy removal of overs. Choose screen size of � or � inch with other sizes available to suit your needs. Optional 2 x 2 inch inner protective screen & hydraulic jacks. Extra support heavy-duty steel bands ensure the handling of tough loads. 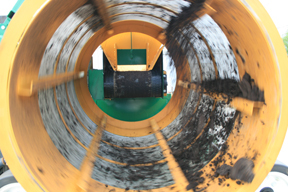 Full-length brushes clean compost screen of debris as it rotates. 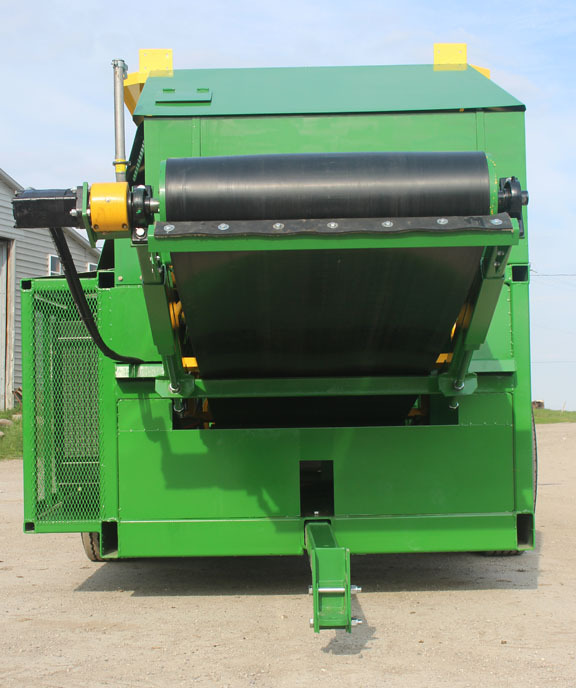 A collector conveyor that runs the full length of the screen discharging past the end of the feeder hopper allows for easy removal of screened compost. Additional scraper prevents build up. An adjustable bar under the conveyor can be connected to a stacking conveyor allowing for 180� movement of the stacking conveyor. Hydraulically driven by a 1.5 litre, 3 cylinder Caterpillar diesel motor, the compost screener operates with ease and efficiency. All compost screener machines come with 1 year warranty. Screens finished compost, soil mixes, peat or minerals for bagging and convenient distribution. Screens out unwanted clumps and inorganic material from compost such as plastic utensils, wine corks etc. Although stationary it can be easily moved with a forklift. Continuous feed hopper provides maximum flow-through efficiency. The compost screen is capable of handling up to 50 cubic yards of compost per hour. Optional screen size of � or � inch with other sizes available to suit your needs. Ideal for small to medium compost operations with an ideal price to match. 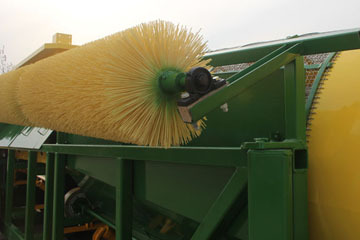 Full-length brush cleans screen of debris as it rotates. 3-sided storage bin directly under the compost screen allows for easy removal of screened product or chute option available. 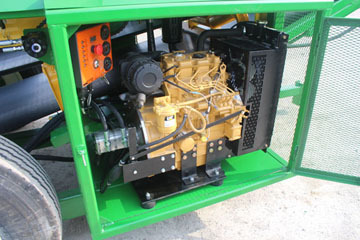 Mechanically driven motorized models are powered by a 7 hp Kohler gas or 3 hp electric engine. This easy to operate, low maintenance, user friendly, compost screener comes with 1 year warranty. This easy to operate, low maintenance, user friendly, compost screener comes with 1 year warranty. 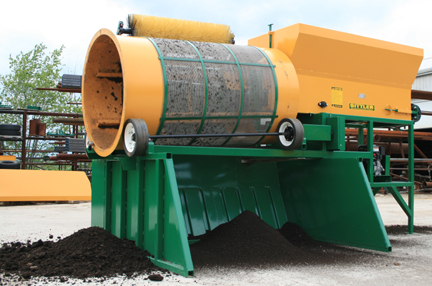 Experience the versatile solution for low cost compost screening and bagging.Conveniently screens and bags finished compost, potting soil mixes, peat or minerals in one combined easy operation. Screens out unwanted clumps and inorganic material from compost such as plastic utensils, wine corks etc and bags your product ready for market. Although stationary when operating, the portable compost screener, bagger and conveyor can be easily transported with a forklift. The mobile compost combo is adjustable for equipment position assembly allowing for site friendly variation to suit your needs. 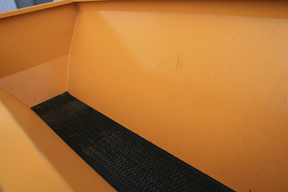 The conveyor can be positioned on either side of the bagger or screener with ease as required. 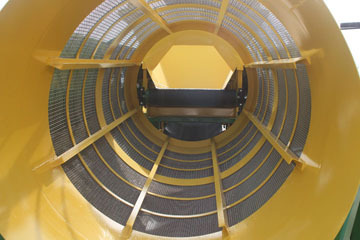 Continuous feed hopper provides maximum flow through efficiency. The compost screen is capable of handling up to 50 cubic yards per hour with compost bagging potential of up to 200 bags per hour. 1-3 man continuous operation, depending on volume requirements, minimizes labor costs. This easy to operate, low maintenance, user friendly, compost screener,bagger and conveyor combo comes with 1 year warranty. 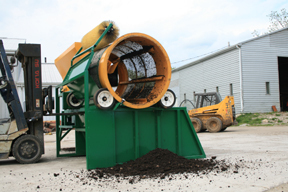 Screen compost, screen peat, screen topsoil, screen minerals, screen woodchips, with a Sittler Compost Screener or screen and bag compost with a Sittler Screener Bagger Combo. 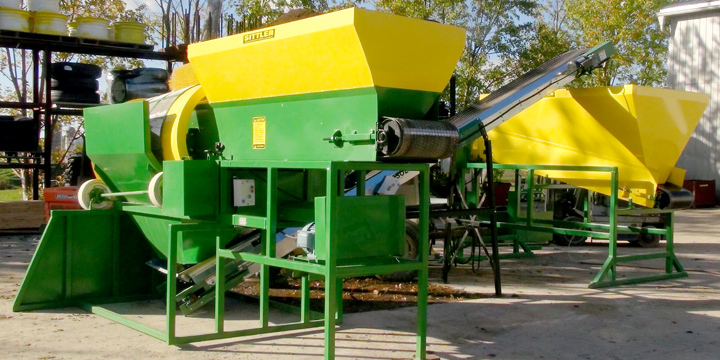 The Sittler Compost Screener and Sittler Screener Bagger Combo available through Global Repair.